Due to their higher capital costs and additional levels of maintenance, significantly fewer road tunnels have been built within the U.S. when compared with other highway structure alternatives such as bridges, viaducts and depressed roadways. As with any construction project, the cost of tunnel construction is largely dependent on the level of effort needed to perform the work as well as the risks faced by the project. The contractor must expend a significant amount of resources to excavate the ground and to purchase the building materials to construct the tunnel. Subsurface conditions significantly influence risk and uncertainty, which raises the costs; however, ground improvement can often mitigate many subsurface risks but, on the other hand, they are also expensive. Highly urbanized metropolitan areas generally add to the costs because of the congested space, proximity to buildings with the potential for damage, limited feasible alternatives, and denser distribution of obstructions such as utilities. The crossing of major transportation corridors, waterways, and other buried infrastructure also adds significant costs to a tunnel project because of the increased level of coordination, scrutiny, and stakeholder involvement; there may also be additional permits that are needed. Contamination of ground and groundwater can significantly increase disposal costs for the muck that was excavated during tunneling operations, which might also trigger additional environmental reviews and measures. Fire and life safety requirements must also be considered; and the procurement of fire and life safety (FLS) equipment can generate nonnegligible costs for the tunnel owner. 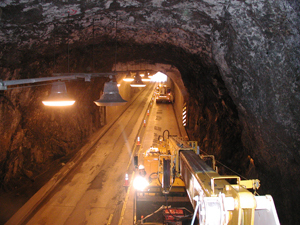 Nevertheless, tunnel structures offer significant economic, social, and environmental advantages over the other more commonly employed highway structure alternatives; this is because the land above the transportation corridors remain available for economic development and community or recreational use; and when appropriately considered, the benefits from building a tunnel might outweigh the costs saved by building cheaper alternative highway structures. For example, when neighborhoods are not separated by long liner transportation arteries, local communities remain intact while heavy, and sometimes hazardous, goods vehicles (trucks) flow below ground where this traffic is grade separated from local roadways and sidewalks which greatly improves safety for those living and working in the area. Furthermore, when viaducts are replaced with tunnels, and when depressed roadways are capped to form a tunnel, long linear parks and recreational trails can be developed for creating green space, which will generate additional value for nearby properties thus potentially resulting in increased revenue streams for local municipalities while sales taxes will also increase as commerce better thrives due to the near elimination of unpleasant loud noises and unhealthy vehicle emissions. MISSION: To develop, promote and advance road tunnel engineering principles, technology, and maintenance practices in the United States through a national team of road tunnel experts. Form a national team of road tunnel experts to serve as a reliable and credible information source to internal (FHWA) and external (all other) customers. A database of ongoing tunnel projects in the United States. Assist AASHTO T-20 Subcommittee on Tunnels to create tunnel specifications, and advance tunnel research.